Liverpool failed to secure their position in the FA cup semi finals yesterday after being held to a draw with BlackBurn Lovers following Sunday's goalless draw at Anfield. Liverpool now have to face the bizarre scenario of having to wait a month for their FA Cup quarter-final replay. The Replay has been scheduled for April 7 or 8 to meet UEFA regulations preventing domestic games from clashing with Champions League or Europa League fixtures. 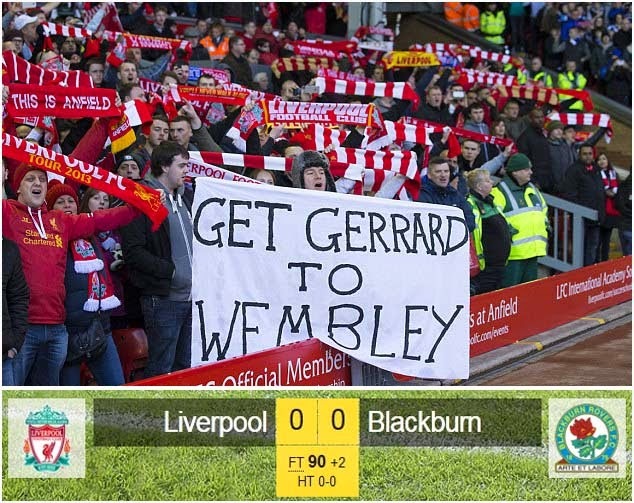 Liverpool, who are seeking their first FA Cup triumph since 2006, will have to face BlackBurn Lovers once again at their home ground by which the game is believed to be tougher than the 1st game.